Welcome! 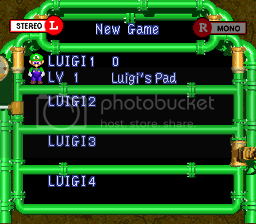 This is the Super Luigi RPG page. Download the IPS patch to play with your SMRPG Rom. 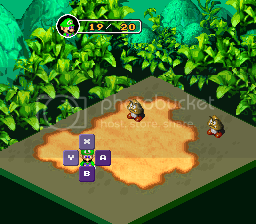 Hello one in all who wish LUIGI would be a playable character in Super Mario RPG. 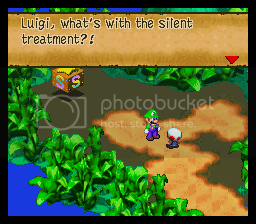 Now with this IPS hack for the game, Luigi is NOW the main character! How do you like that? Anyway this hack was done by me and is maybe about 80% done. That's just a really basic estimate. Things I have left to do is correct some Mario to Luigi palettes, corrent any Mario sprites to Luigi, and finish the script remake. Oh and of course change Peach into Daisy. Well I hope everyone here likes what I have done so far and down below you can download the patch for yourself. This is how to patch the IPS patch to your Super Mario RPG Rom. First make a copy of your Rom and rename it as the same name of the IPS patch. Or you can rename the patch to better suit your copy of the SMRPG Rom. Now use a program, I suggest Lunar IPS, to patch your game to complete the hack. Everything that I have changed will add or change itself in the copy of your SMRPG Rom. If you don't want to patch your Rom for some reason you can also have Snes9x or Zsnes (not sure exactly which one) auto-patch the game with the IPS without actually patching the Rom itself. So like it combines the two then seperates them when your done playing. Make sure the patch and the Rom have the same name and are in the same directory. Then load the Rom into Snes9x or Zsnes and find an option for auto-patching if nessesary. 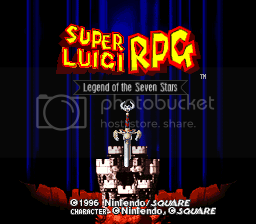 To find out if it is patched correctly, program or emulator, instead of Super Mario RPG for the logo in the game it should say Super Luigi RPG. As you can plainly see, this is the what the title screen looks like actually in the game. I had a friend help me out with this and so I give my thanks to him. I say it looks good but it could use some touch up work. In this shot, it shows that I've changed all of Mario's name in the file menu selection screen to Luigi. I've also changed all of the Mario names in the game to Luigi. Also you can see what Luigi looks like in front person view. Once again, as you can see Toad talking to Luigi, the name Mario is replaced by Luigi. You can also see Luigi at an angle view. 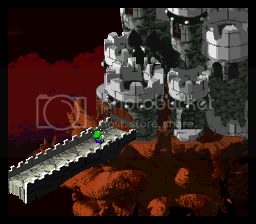 This is just a shot of Luigi when he is tiny for some scenes like this. It's mainly to show the color of Mario to Luigi. In here you can see Luigi in battle. When I took this screenshot, I didn't change the sprite of the Luigi in the top left corner for the HP life. As you can see it's more Mario shaped just with a Luigi palette.